From Benji the Hunted, a film that Siskel and Ebert fought over. Yes. These do happen. I believe this one happened in Canada. Wolves attack a Russian cop! It’s actually fake. Contrived. Not real. I wish this had come out around April 1. This would have been an awesome April Fools’ Day prank. Not that I’ve ever pulled one of those ;). But pretty close– Rye Brook, Westchester County. The first confrontation happened at 6:50 p.m. on Eagles Bluff, where a coyote lunged toward a 14-year-old boy who was playing with other children. The teen struck it in the face and the coyote ran off into the woods, police said. That boy was not injured but did have marks where the coyote made contact with him, police said. About an hour later on Hillandale Road, a coyote lunged at the 2-year-old who was playing with her 28-year-old father in the driveway. “The father was able to scare off the coyote but not before the coyote bit him on the back of the leg,” police said in a news release. Father and daughter sought treatment at Greenwich Hospital; the father’s injury was superficial and the girl was not injured, though she too had a mark on her skin, police said. Rye Brook police and trappers responded last night to both areas. Two trappers were out this morning when one of them discovered a coyote in the woods off Acker Drive. The village developed what it called a “comprehensive tracking program” early last month in response to two attacks. A 6-year-old girl, Emily Hodulik, was attacked June 26 by two of the animals as she played outside her home on LaSalle Avenue in Rye. She was bitten on her shoulder and scratched on her back. On June 30, a coyote bit 3-year-old Erika Attar on her neck and torso as she played in a backyard on North Street in Rye. In light of last night’s confrontations, the village reminded people not to leave pet food or trash outside and said small children and pets should not be outside unattended. Feinstein said the village’s latest three-week trapping program was to expire this week. “Given the incidents, we’ll re-examine that,” she said. To solve this problem, the village is going trap that particular coyote or coyotes and then is going to institute a hazing program. But I post this article as a contrast to a coyote encounter I had Sunday evening. I had the killer golden retriever out for a nice long evening walk. She was off-leash of course, bounding ahead like the fool she is. As she hit the end of the pasture, she stopped. The her hackles raised. I’ve never seen Miley raise her hackles. As I came around the turn, I saw four dog-like shapes in the tall grass at the end of pasture. They were coyotes. Two were relatively large– probably the local mated pair– and two were a bit smaller. They were probably this year’s pups. The coyotes bolted for the woods. And Miley bolted for me. 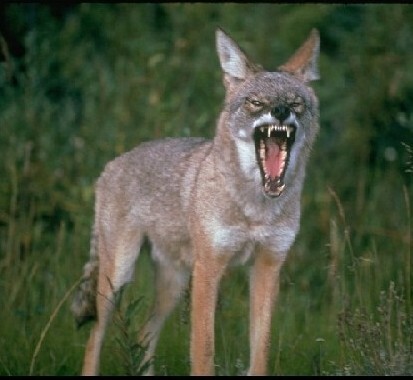 Now, think about how different the reactions were between my encounter with the coyote and those in Westchester County. The ones in my part of the world are heavily persecuted. I’m not excusing the paranoid hatred people have for these animals. But because they are hated so much, these coyotes get taught an important lesson. They have learned that whenever they see a person, that person is likely to start shooting at them. Because some people now run foxhounds after coyotes, the coyotes have also learned that large dogs are not safe. In Rye Brook, they have never experienced those lessons. Coyotes, dogs, and wolves are intelligent animals. Much of their reactions to certain stimuli are the result of learning. Not all wolves, dogs, and coyotes are going to become aggressive towards people. The coyotes and wolves that attack people have learned that people are no threat and the opportunist in them tells them that it might be okay to attack people as a food source. Note that the coyote in Rye Brook was attacking children. Most confirmed wolf attacks I’ve read about are actually on either women or children. That’s not to say that wouldn’t attack a man, but women and children are easier targets. Even though these attacks have occurred, they aren’t really all that common for a variety of reasons. I oppose using these attacks to justify persecution. This is simply taking advantage of a tragedy. But I think one could make the case that limited hunting of wolves and coyotes might be good for them. Hunting them would teach them that people are not a potential prey source, and they would learn to avoid us at all costs. These wolves and coyotes could live in the same areas utilized by people, and conflicts would be greatly reduced. And the anti-predator paranoia would subside a bit. I know where I live, there are plenty of coyotes, but the coyotes themselves really don’t bother people. I’ve heard of a few dogs coming up missing. No coyote attacks on people at all. And that’s because these coyotes have learned that people are very dangerous animals. We should not hate these animals. We should not be drawn into persecuting them. But to be able to live with them, we must have a certain understanding. They have to be afraid of us. We do not have to be afraid of them. Maybe hazing will teach the Rye Brook coyotes how to fear us. Maybe trapping will remove the offending animals from that population. But it is clear that we are going to figure out a way to live with these animals, and the public’s safety is quite important. And we may have to do things that aren’t quite so politically correct in order to live with these magnificently resilient canines. A female special education teacher was mauled to death by a wolf while jogging in Alaska, authorities told local media. The body of 32-year-old Candice Berner, originally from Pennsylvania, was found Monday night off a road leading to the Chignik Lake airstrip, The News Tribune reported. Police investigating the case believe she was killed in an “animal attack, possibly a wolf attack” after locals reported wolf sightings. The people who found the woman’s body while returning from clam digging say that a wolf stalked one of them earlier in the day, the Alaska Dispatch reported. The woman’s death is still under investigation and her body is being taken to Anchorage for an autopsy, police said. My guess is this is a fatal wolf attack. If this is confirmed, this would be the first documented, no doubts about it, fatal attack by a healthy wolf in North America. I am convinced that Kenton Carnegie was also killed by two wolves as he walked near an illegal garbage dump belonging to a mining company. This attack happened in 2005, and there was a major scandal. In 2007, a jury inquest found that the wolves had indeed killed Kenton. However, there are still people who doubt the findings. But does that mean wolves are especially dangerous to people? Sharks have attacked more people than wolves have, and we are land animals who would be easy prey for a wolf. Part of the reason is that centuries of persecution have made wolves very nervous animals. If they smell us, they leave– just as coyotes normally do. But any death is a tragedy. It is little comfort to the family to know that she was either the first or second person to be killed by a wolf in North America (if it is indeed confirmed).